© 2010 Small et al; licensee BioMed Central Ltd. This is an Open Access article distributed under the terms of the Creative Commons Attribution License (http://creativecommons.org/licenses/by/2.0), which permits unrestricted use, distribution, and reproduction in any medium, provided the original work is properly cited. The presenilins form part of a complex of membrane proteins that are involved in the proteolytic cleavage of cellsurface molecules. 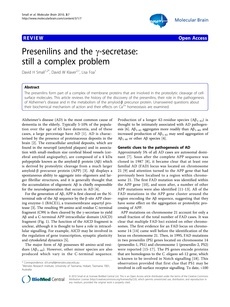 This article reviews the history of the discovery of the presenilins, their role in the pathogenesis of Alzheimer’s disease and in the metabolism of the amyloid-b precursor protein. Unanswered questions about their biochemical mechanism of action and their effects on Ca2+ homeostasis are examined.